The most prominent element to Messy’s artworks is that their compositional material is primarily sprayed paint. 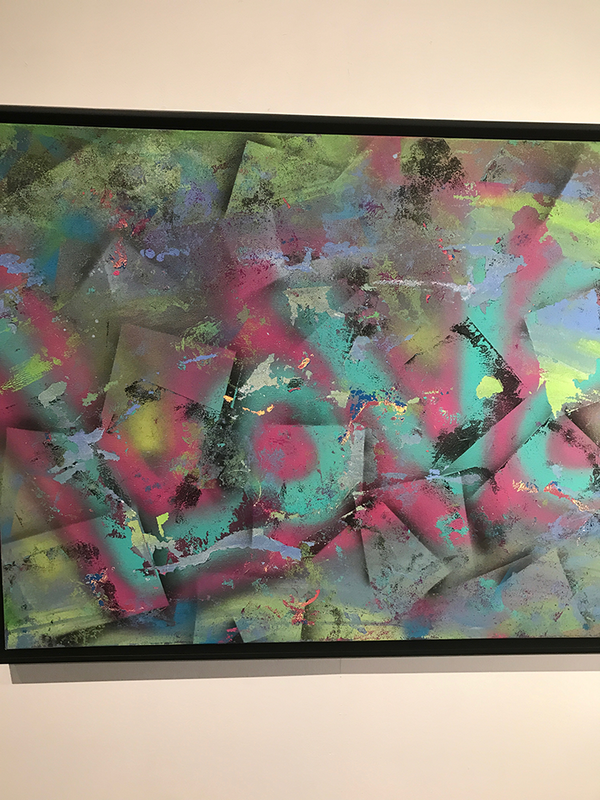 One’s first impression of aerosol paint is that of a street artist, using urban locales and other people’s property as their canvases of panoramic, visceral murals of creative typographies. The fact that here Messy is able to refine its use, condensing it to such relatively speaking minute portraitures is literally unthinkable, for its styling is more “classically” – if we can call it that – abstract. Thus, this is my first encounter of abstract spray-paint artistry. The significance may not be seen simply as the finished product; the subject is unaware of how this paint is methodologically used as a tool by the artist to accomplish her works. The method is part of the madness in bringing to life not scatter-brained cacophonous images, but uncanny novel arrangements of abstract geometrical patterns which in a lesser artist may appear quite redundant. But with Messy, each brings a unique feature. Perhaps it’s texture; perhaps it’s the palette of choice; perhaps it’s again the geometries which appear as snowflakes on the gallery’s walls with form distinctly different from each other. The aesthetic may arguably not rise above décor, but its neutral colors and consistency in the theme is actually quite a challenge to, again, create a series of paintings which in a lesser artist would be indistinguishable from each other. When arguing that this is simplistically beautiful, to be used as artwork to ameliorate the mundane in a residence or place of commerce, it does not mean that the work is necessarily inferior. For this is comfortably the quintessence of the task of art, to raise mankind above its commonness, making the every day more precious and sacred. And comfortably, too, the work is created in such a serendipitously harmonious manner to be able to complement the full faculty of human inhabited spaces, it is an unforeseen accomplishment of the series. But there is a hidden secret among some of the paintings which imbue it with another level of aesthetic, that being the efflorescence once the lights go out. In another manner, then, the nighttime occupancy of a habitat can glow with a gentle whisper of splendor. And it is a whisper, not a screech, being tastefully subdued yet also not being done for mere effect; there is an actual layer of astral imagination in these particular works as if one is peering into the nighttime sky through a telescope. This is quite an innovation to suggest that perhaps not all artwork needs to be illuminated in order to be beautiful? That painting materials now can create added effects, and that these effects can be aesthetically advancing? This is a much more preferable direction than political rancor in the art, and it is delighting to see an artist able to capture the spirit of art.